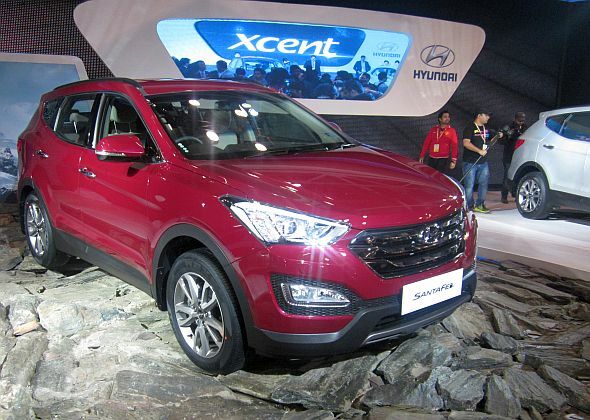 Snapshot: Hyundai India has launched the 2014 Sante Fe SUV at the ongoing Indian Auto Expo. Prices of the Sante Fe SUV range between 26.3 lakh rupees and 29.25 lakh rupees, ex-showroom Delhi. Bookings are now open with deliveries to begin immediately. The 2014 Santa Fe is powered by a 2.2 liter turbo diesel engine that outputs 197 Bhp of peak power and 422 Nm of peak torque. Transmission options include 6 speed manual and automatic gearboxes. The SUV comes in front wheel drive and all-wheel drive variants. The new SUV from Hyundai is a 7 seat model that will square off with the likes of the Toyota Fortuner and the Mitsubishi Pajero Sport. Click here to read more about the all-new Santa Fe SUV.